You might resemble or act more like your mother, but a novel research study from UNC School of Medicine researchers reveals that mammals are genetically more like their dads. Specifically, the research shows that although we inherit equal amounts of genetic mutations from our parents - the mutations that make us who we are and not some other person - we actually "use" more of the DNA that we inherit from our dads. The research, published in the journal Nature Genetics, has wide implications for the study of human disease, especially when using mammalian research models. For instance, in many mouse models created for the study of gene expression related to disease, researchers typically don't take into account whether specific genetic expression originates from mothers or fathers. But the UNC research shows that inheriting a mutation has different consequences in mammals, depending on whether the genetic variant is inherited from the mother or father. "This is an exceptional new research finding that opens the door to an entirely new area of exploration in human genetics," said Fernando Pardo-Manuel de Villena, PhD, professor of genetics and senior author of the paper. "We've known that there are 95 genes that are subject to this parent-of-origin effect. They're called imprinted genes, and they can play roles in diseases, depending on whether the genetic mutation came from the father or the mother. Now we've found that in addition to them, there are thousands of other genes that have a novel parent-of-origin effect." These genetic mutations that are handed down from parents show up in many common but complex diseases that involve many genes, such as type-2 diabetes, heart disease, schizophrenia, obesity, and cancers. Studying them in genetically diverse mouse models that take parent-of-origin into account will give scientists more precise insights into the underlying causes of disease and the creation of therapeutics or other interventions. The key to this research is the Collaborative Cross - the most genetically diverse mouse population in the world, which is generated, housed, and distributed from UNC. Traditional lab mice are much more limited in their genetic diversity, and so they have limited use in studies that try to home in on important aspects of diseases in humans. The Collaborative Cross bred together various wild type mice to create wide diversity in the mouse genome. Pardo-Manuel de Villena said that this diversity is comparable to the variation found in the human genome. This helps scientists study diseases that involve various levels of genetic expression across many different genes. 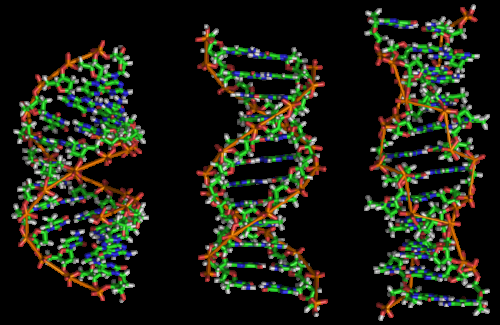 Gene expression connects DNA to proteins, which then carry out various functions inside cells. This process is crucial for proper human health. Mutations that alter gene expression are called regulatory mutations. "This type of genetic variation is probably the most important contributor - not to simple Mendelian diseases where there's just one gene mutation [such as cystic fibrosis] - but to much more common and complex diseases, such as diabetes, heart disease, neurological conditions, and a host of others," Pardo-Manuel de Villena said. "These diseases are driven by gene expression, not of one gene but of hundreds or thousands of genes. "The Collaborative Cross and the expertise we have at UNC allow us to look at different gene expression for every gene in the genome of every kind of tissue," said Pardo-Manuel de Villena, who directs the Collaborative Cross. For the Nature Genetics study, Pardo-Manuel de Villena's team, including first author James Crowley, PhD, assistant professor of genetics, selected three genetically diverse inbred strains of mice that were descended from a subspecies that evolved on different continents. These mice were bred to create nine different types of hybrid offspring in which each strain was used as both father and mother. When the mice reached adulthood, the researchers measured gene expression in four different kinds of tissue, including RNA sequencing in the brain. They then quantified how much gene expression was derived from the mother and the father for every single gene in the genome. "We found that the vast majority of genes - about 80 percent - possessed variants that altered gene expression," Crowley said. "And this was when we discovered a new, genome-wide expression imbalance in favor of the dad in several hundred genes. This imbalance resulted in offspring whose brain gene expression was significantly more like their father's." For every gene a scientist is interested in, Pardo-Manuel de Villena's team can create mice that have low, intermediate, or high expression of genes. And they can explore if that expression is associated with a specific disease. "This expression level is dependent on the mother or the father," Pardo-Manuel de Villena said. "We now know that mammals express more genetic variance from the father. So imagine that a certain kind of mutation is bad. If inherited from the mother, the gene wouldn't be expressed as much as it would be if it were inherited from the father. So, the same bad mutation would have different consequences in disease if it were inherited from the mother or from the father." These types of genetic mutations across hundreds of genes are hard to study and a major bottleneck to realizing the promises of the post-genome era. But Pardo-Manuel de Villena said, "Thanks to the Collaborative Cross, the mouse can be used to model how these genes work and how they impact health and disease in any kind of tissue in the body." The fact that organism-level thermoregulation requires nutrient-dependent protein biosynthesis and degradation, which must lead to the pheromone-controlled fixation of amino acid substitutions that differentiate all cell types in all individuals of all species, seems to go unnoticed. Thus, no matter how much experimental evidence attests to the obvious facts that link physics and chemistry to the conserved molecular mechanisms of nutrient-dependent pheromone-controlled biodiversity, in this misrepresentation of top-down causation we have another excuse for the biologically uninformed to continue believing in ridiculous theories. Pheremones are a communication medium. period. They info they carry does the control, not the pheromones. That's like claiming that "Life is physics and chemistry and communication" more than 2 decades after others have detailed the links from food odors and pheromones to the differentiation of all cell types in all individuals of all species. Conclusion "Olfaction and odor receptors provide a clear evolutionary trail that can be followed from unicellular organisms to insects to humans (Keller et al., 2007; Kohl, 2007; Villarreal, 2009; Vosshall, Wong, & Axel, 2000)." Excerpt: Though biologists have studied bacteria for nearly a century, this immune system was only discovered in the last 10 years. "...several immunological findings and the presence of MHC-encoded, sexually dimorphic immunological tissues in both the nasal cavity and epidermis have prompted at least one researcher to formulate an immunological hypothesis of sexual and gender orientation (Binstock, 1996)." See my model of Nutrient-dependent/pheromone-controlled adaptive evolution: a model. Actually, Ren, it's been shown that too low a mutation rate also has negative consequences. There's a happy medium. In Lenski's experiments, for example, the E. coli saw huge fitness increases following mutations that increased the overall mutation rate. Lenski of Michigan State University in an e-mail to The Scientist. "Their experiments show how a biological function—in this case, flagellar motility in Pseudomonas fluorescens—can re-evolve after the deletion of a seemingly critical gene. The bacteria regained motility not by reacquiring the lost gene . . . but instead by mutations in other genes that put their products to new uses." -- in four days. What do you think the mutation rate might have been that enabled the fixation of amino acid substitutions required to differentiate the cell types of the bacteria without flagella to the cell types of those with flagella in four days. How did fixation occur? In your comment in that The Scientist link, you praise the Church et al. paper. You're aware that's a enzyme optimization mutagenesis experiment , right? Excerpt from my comment: "The authors detail how ecological variation is linked from atoms to ecosystems via nutrient-dependent amino acid substitutions that stabilize protein folding, which they compare to mutations that perturb protein folding." If you want the findings to be interpreted in the context of a mutagenesis experiment, why did they take great care to try to minimize the danger posed by what the Pseudomonas sp. did in four days. The claim that the flagellum re-evolved due to mutations is exactly the kind of bad press that would stop George Church's group -- if serious scientists believe he had not protected them from the mutation-driven evolution via the synthetic amino acid substitution. Ask Church yourself what the implications of his experiment are. I guarantee you won't like what he has to say. Do you STILL not understand how mutagenesis is performed? The entire point of them is to cause mutations and observe the outcomes. That's precisely what they did. Journal article excerpt: "We hypothesize that this global imbalance is ancestral to classical imprinting. In other words, small differences in parental methylation at CpG islands close to the TSS may have been exploited by natural selection to create classical imprinting." Natural selection of food and pheromone-controlled RNA-directed DNA methylation lead to nutrient-dependent species survival via the physiology of reproduction and fixation of RNA-mediated amino acid substitutions in the DNA of organized genomes in species from microbes to man. That is the only explanation for the biophysically constrained chemistry of protein folding that links ecological variation to ecological adaptations manifested in the morphological and behavioral diversity of all species. It is why biologically uninformed science idiots will not tell us HOW mutations and natural selection lead to evolution. Their claims explain nothing. They protest, but provide no experimental evidence. Why? His results were placed into the context of Christ's work on heterochronic parabiosis (exchange of blood for a longer life). They link nutrient-dependent pheromone-controlled cell type differentiation from RNA-mediated amino acid substitutions to variants in RBCs and WBCs. That links the immune system to cell type differentiation in all cells, tissues, organs, all organ systems of mammals during their life history transitions. Nothing currently known about mutations links them to regenerative medicine or to the nutrient-dependent re-evolution of the bacterial flagellum. Everything links RNA-mediated amino acid substitutions to cell type differentiation in all cells of all individuals of all species during their life history transitions. The works of Church et al and of Christ et al have been integrated, which explains what you cannot. The entire point of them is to cause mutations and observe the outcomes. That's precisely what they did. Church et al showed that the synthetic amino acid substitution stabilized the DNA in the organized genome of the E. coli. Christ et al extended that fact from nutritional epigenetics to "The Pharmacology of Regenerative Medicine." Observing the outcome of mutagenesis experiments is a waste of time if you think your results explain anything at all about how cell type differentiation occurs in the context of the biophysically constrained chemistry of nutrient-dependent RNA-mediated protein folding. You might just as well skip the experiments and claim that mutations are naturally selected or that they somehow otherwise lead to the evolution of new species. Alternatively, you could meaningfully interpret the results of your experiment and get a job teaching "evolution for dummies" or as a manager at McDonald's. Good luck with your career goals. Their study had nothing to do with genome stability. That's not what they were examining. Their dependent variable was enzyme activity. Sorry, I thought that amino acid substitutions altered the thermodynamic stability of enzymes, which is why they focused on prevention of mutations by helping to ensure controlled enzyme activity, which links metabolic networks to genetic networks in species from microbes to man via the biophysically constrained chemistry of nutrient-dependent RNA-mediated protein folding and the physiology of reproduction. Why do you think they examined enzyme activity as their dependent variable? If you don't know, perhaps Captain Stumpy can help you figure it out. Alternatively, perhaps both of you should learn what every other serious scientist knows about cell type differentiation in every species. Start with this: Clinically Actionable Genotypes Among 10,000 Patients With Preemptive Pharmacogenomic Testing http://www.medsca...24253661 You can always go backwards from there and arrive at your current level of overwhelming ignorance. Their study had nothing to do with genome stability. What do you think Christ et al tells us? Why did you only address one of the works I cited? How do mutagenesis experiments lead to valuable information about amino acid substitutions in blood cells that link every cell in every individual of every species -- with a circulatory system that includes WBCs and RBCs -- to nutrient-dependent pheromone-controlled survival of the species? First you talk about DNA stability and now you're discussing enzyme stability. Which is it? That's the complete opposite of what they were doing. Again, do you understand the steps involved in mutagenesis? The first is to deliberately cause mutations to the templates. Why do you think they examined enzyme activity as their dependent variable? Through iterations of genetic diversification and selection, we increased the production of naringenin and glucaric acid 36- and 22-fold, respectively. The entire point of their experiment was to make better enzymes. Why did you only address one of the works I cited? Christ et al. concerns reversing aging processes in medicine. It doesn't concern evolution. Until you learn how nutrients are linked from metabolic networks to genetic networks all we will see is more displays of ignorance like this. You are an embarrassment to everyone at Carthage College and at McDonald's. Until you learn biochemistry, all we'll see is more indications that you think the more stable a particular piece of DNA is, the more stable the protein it codes for is. They're not related. You have again misrepresented what I have detailed in a series of published works during the past 20 years. At the same time, serious scientists have moved so far beyond your limited understanding of biologically-based cause and effect that you seem intent on preventing others from learning about the obvious links between nutrigenomics and pharmacogenomics via metabolic networks and genetic networks. It can be explained by my model in less than 6 minutes. You mean the serious scientists that Stumpy and I have contacted and proved don't agree with you? You used to think Extavour was a serious scientist. How short is your list of serious scientists getting? All that is is a study of what genotypes exist for the purpose of identifying which genotypes change peoples' responses to drugs. It says nothing of how those variants evolved. What specific claim of yours do you think this paper supports? It'd be best to pass along something verbatim from you to Van Driest since you refuse to contact authors on your own to see if your interpretations are correct. you think everyone else needs to "learn" something?